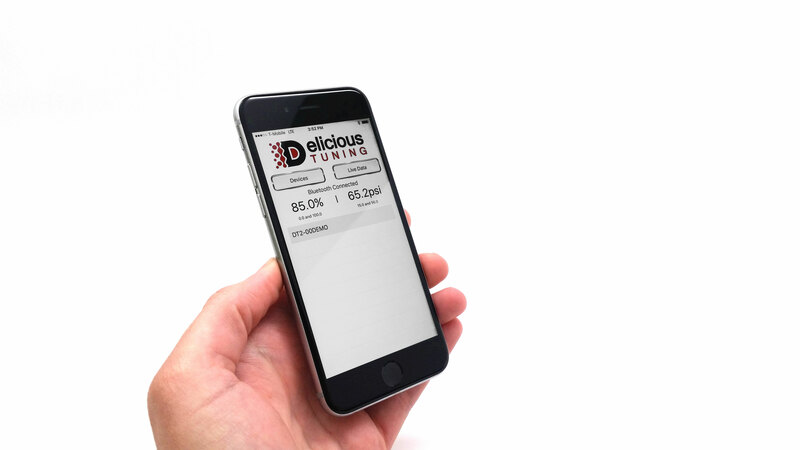 VISTA, CA (August 22, 2017) – In response to customer demand, Delicious Tuning has completed and released the company’s iPhone-based (version 10.2 and newer) data-monitoring app for its flex-fuel systems. Now, customers of all stripes – whether Android or iPhone-powered – can use their mobile device to directly monitor their Delicious Flex-Fuel kit, track fuel pressure and ethanol content, and data-log minimum and maximum values in real-time. The iPhone app has been an ongoing challenge for Delicious. Apple is historically protective of its app store, and finding a working balance with them (without making this product cost extra) was an exercise. It was worth the effort: the improved efficiency of Bluetooth “LE” chips in new iPhones doubles the app’s speed, quadruples its range, and improves device connectivity. Because Delicious Tuning has sold almost 1000 flex-fuel kits, there will be legacy parts updates to chase down. As always, the company will stand behind their product. If you paid for an early iPhone-paired flex-fuel kit and can verify it, Delicious will need to update your firmware and hardware (at our cost – give us a call). If you’ve recently bought a flex-fuel kit and would like to make it iPhone-friendly, contact Delicious for how to do it. Note: some of the company’s newest flex-fuel kits are already iPhone-capable, (SN: 0739 & up) so download the app and give it a try. If nothing happens, we have your upgrade solution. Delicious Tuning’s very own Brian “Spaceship Parts” Pierce is competing in the Specialty Equipment Marketers Association’s (SEMA) new executive/new product “Launchpad” showcase. Support Delicious, Pierce, and the corn fed horsepower of ethanol-blend fuels: visit SEMA’s page: CLICK HERE and click the vote button for power! Delicious Tuning specializes in advanced engine calibration and Flex Fuel kits for race, track and recreational late-model high-performance cars. The Delicious staff is a collection of engineers and calibrators with more than 45 years of experience programming, tuning and busting knuckles. Their website is DeliciousTuning.com (info@delicioustuning.com), and you can call the shop at 408.480.0995. Some products and services offered by Delicious Tuning are for race and off-road use only.